HR Compliance Independent Contractor and the Overtime Eligible classification web-based tools reduce compliance risks by guiding you to correct determinations whether workers are independent contractors for employment tax, benefit plan, and mandatory compensation purposes and whether employees may be treated as exempt from minimum wage and overtime requirements. The tools provide clear and concise explanations of applicable government agency tests, fillable forms to document and record all pertinent data and assessments, and helpful guides, tips, and examples. HR Compliance Basic Fifty State Employment Law Reference Package is a comprehensive employment law resource that helps you navigate the complexities of ever-changing federal and state laws and regulations. Organized by familiar topics and designed with easy to use site navigation, HR Compliance Basic reduces the time and effort necessary to quickly understand and comply with the law in any workplace. The Employment Law Update Service included with the tools and the Reference Package delivers important changes in state and federal laws directly to your in-box, including critical developments in employment law topics. Reduce risks. Find answers quickly. 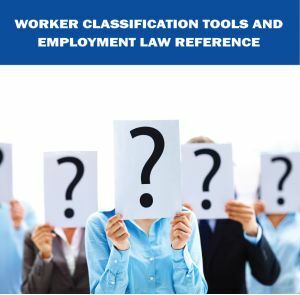 Stay in Compliance with the HR Compliance Worker Classification Tools and Employment Law Reference 12 month web subscription. When you purchase HR Compliance, your web access will be emailed to you from services@thinkhr.com.